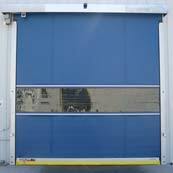 High-speed traffic doors have become increasingly common in industrial environments by helping increase productivity of freight traffic, lifting equipment and personnel traffic. 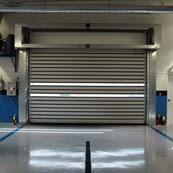 These door products open in seconds and can be equipped with optional loop detectors and other detection devices to further boost traffic productivity. With an opening speed of up to 60 inches per second, the Spiral® door offers the speed you need for high-traffic situations. 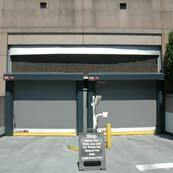 Rigid, aluminum slat construction eliminates any need for a second overnight security door. When it was introduced with the first-ever Break-Away™ bottom bar, the Fast-Seal high-speed roll door changed the industry forever. 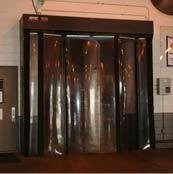 Suddenly, a roll door is able to take a hit without suffering damage. It is this concept around which the high-speed door industry has grown, but no other manufacturer has matched the dependability or durability of the Fast-Seal with the original Break-Away™ bottom bar. This, along with its patented counterbalance and tension system, is why the Fast-Seal remains the best exterior high-speed door on the market today. Rytec has taken the PredaDoor, the industry’s top selling high performance door, and added NXT generation features to offer the most advanced direct drive roll door available - the PredaDoor NXT. The Predadoor NXT offers a tighter seal and an advanced wireless safety system. It is durable and can take a hit. The NXT Quick-Set™ repair system engages with the push of a button after aligning the bottom bar. The PredaDoor NXT offers high performance for interior and exterior applications where speed, low maintenance and dependability are critical. Plus, a new two-year warranty on materials and workmanship makes it the best value in the business. With its natural ability to withstand forklift impact without sustaining damage, the Fast-Fold® door introduced the Break-Away™ concept to the United States in 1985. It can be used almost anywhere, for interior, exterior, warehousing, manufacturing or commercial applications. Because of the many patented, proven design features like its rugged Tec-Trak™ and floating Ryflex™ roller system, it provides millions and millions of cycles of dependable service.